WASHINGTON, Ind. – Have you ever seen a creature you can’t explain – something that shouldn’t exist, but made your blood run cold and every hair on your body stand straight up? You’re not alone. Long before and ever since the first European settlers set foot in Indiana, there have been reports of strange encounters with beasties in the state’s forests and lakes. These creatures are known as cryptids, or animals whose existence or survival is disputed or unsubstantiated. Wild Men/Bigfoot. While most Bigfoot reports originate in other parts of the country, Indiana isn’t without its stories of encounters with large, hairy humanoid creatures. A Dec. 30, 1839, article in a Pennsylvania newspaper tells of a 4-foot-tall “wild child” covered in light brown hair running about the hills in Michigan City, Indiana. Another wild child was sought by a posse of 300 in June of 1860 in Carroll County. And, in 1937, an animal some described as a “monster hairy ape” and others as a “giant sloth” or a “cross between a sloth and ape” was believed to be stalking the Booneville area. What has come to be known as the “Crosley Monster” was first reported in July 2006. Four boys camping in the Crosley State Fish and Wildlife Area in Jennings County (about an hour north of Louisville), saw two glowing red eyes, which they estimated to be about 8 feet off the ground, watching them as they fished. When they shined their light on the watcher, whatever it was became angry, rushed in their direction and the boys fled. They said the monster was covered in matted dirty hair from head to toe and had bright yellow teeth. What sets this sighting apart from most Bigfoot stories is that when the youngsters first saw the creature, it was standing upright, but when it when it came toward them, it ran on all fours. The boys managed to get away as the monster ran into a field. There have been reports of bloodcurdling howls that stops people in their tracks in the same location. Green-Clawed Monster. In 1955, two women swimming in the Ohio River near Evansville reported a terrifying incident involving an unknown creature. One of the ladies was floating on a raft when a green, hairy clawed hand grabbed her leg, pulling her under the water. She escaped, however a green hand print reportedly remained on her leg for days. The fact this incident occurred shortly after the release of Creature from the Black Lagoon is surely pure coincidence. Beast of Busco. “Oscar” is definitely the most famous of Indiana’s cryptids. The “Beast of Busco” is said to be a giant turtle with a shell as big as a dining room table that inhabits a lake near Churubusco, Indiana. First spotted by the owner in 1898, Oscar’s popularity picked up steam when the humongous diapsid was spotted by two fishermen in 1948. 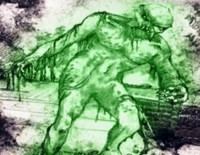 The “discovery” led to an all-out effort to capture the monster, but several attempts, including draining most of the lake, failed to produce Oscar. The town, however, has capitalized on the sightings, dubbing itself “Turtle Town USA” and celebrating its cryptid each year with a Turtle Days Festival. Monster snake. Don’t go near the graveyard west of Oxford, Indiana. According to a September 1889 report in the Lafayette Courier, a monstrous snake, 15-feet-long and “as large in circumference as a good-sized stovepipe, with eyes of fire, adorned with horns underneath fully 10 inches long,” lurks among the grave stones. It was rumored the snake fed on the corpses in the cemetery. Puk-Wud-Jie. No Hoosier cryptid list would be complete without Madison County’s mysterious troll-like critters. According to American Indian folklore, the local variety, standing 2- to 3-feet-tall with rounded white faces and dull blond hair, inhabit the area near the White River in Mounds State Park. With magical powers and a penchant for playing tricks, the “little wild men of the forest” were believed to be mostly peaceful and even participated in trade with the local Indians. There are periodic Puk-Wud-Jie explorations in the park wherein children and adults attempt to lure the little creatures from their hiding places with offers of peanut butter cookies. Sources: Heather Bremer, The Washington Times-Herald, October 23, 2018; 103GBF, September 12, 2018; and Darcie Nadel, Exemplore, December 30, 2016. It doesn't make any sense that a man would be wearing a green mask and blankets and scaring people in a state where a lot of people have guns. I also think that the women would have been able to tell if it had been someone in a costume.